OPEN HOUSE APRIL 28th 2-4PM, with a GIFT CARD DRAWING! Wait until you step into this immaculately maintained home! Upon driving up you&apos;re greeted with professional landscaping including shrubbery, flowers, and landscape lighting. Once a Ryan Homes model, this home includes upgrades that are sure to capture you. The first floor boasts a stunning kitchen with granite countertops, stainless GE appliances, tiled backsplash, spacious walk-in pantry, extended island perfect for dining or food prep, and a morning room with plenty of natural light and space to dine with your family and guests. Kitchen is open to the family room which includes plenty of lighting, surround sound and pre-wiring for your HDMI connections. You will also find what could be a study/living room on the first floor as well as your laundry room, that includes a brand new washer and dryer. Just off the morning room, your patio will allow for the perfect space to BBQ and entertain guests while children play in the spacious back yard that includes irrigation in both front and back. 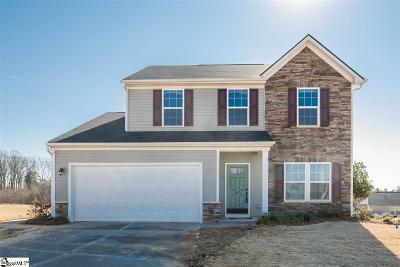 Second floor boasts your Master BR which includes trey ceiling, walk-in closet, surround sound, alarm control panel and a full bath with tiled shower, 2 secondary BRs, loft area with surround sound, that can EASILY CONVERT TO A 4th BR, and attic access with a generous amount of storage space. As if this isn&apos;t enough, other features include high efficiency furnace, tankless water heater, garage with epoxy flooring, surround sound AND its already pre-wired for a split A/C unit, transferrable termite bond and best of all...its MOVE-IN-READY. Builder has inspected and stands behind remaining 10 year structural warranty. Located in an excellent school district and minutes from the interstate. This home will not last long, so schedule your showing TODAY! Please note taxes are at 6% rate, and will be significantly lower at the owner-occupied rate.